Why do bees die when they sting but wasps don't? 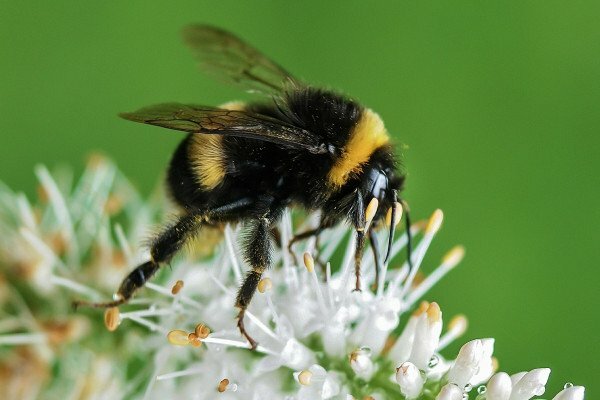 Chris - Are the bees faring better than your ants? Eleanor - Yes, they’re doing marvellously. Chris - Are you putting RFID tags on them? Eleanor - No, no, no. We’re looking after them brilliantly. They’re doing really well. They’re excellent. I’m very proud of them all. Chris - So the bee proud of you. Eleanor - Yeah, exactly. They are amazing. So what you're talking about is the fact that honey bees, in particular - there’s many types of bees but I’m guessing that in this case we’re talking about honey bees, they have a barbed sting. So if they sting something like a mammal that’s got nice fibrous tissues then they will actually pull out… If they stick their barb in it will get stuck, and so then if the bee is removed quickly, then it will pull out the sting and quite a lot of associated tissue as well, so they effectively disembowel themselves, which is quite sad. But the amazing thing about it is they can still live to - I think the study said up to 114 hours after effectively disemboweling themselves. Chris - Why have they evolved to do that though? Because Australian native bees don’t have barbs. They are stingless. They’re barbless. Eleanor - This is the honey bees particularly. I was reading about this to try and answer this question because I thought that might come up, and there seems to be two schools of thought. One of which is suggesting that perhaps it’s maladaptive and it’s just that it was evolved to sting other insects which don’t have the fibrous tissues like we have. The other school of thought, which I think I prefer, is the idea that if they have the sting in longer in causes maximum amount of damage to the mammal. Because there whole time it’s pumping the venom into the mammal and so, essentially, the worker is sacrificing herself for the colony. Then the fact that they can survive for up to 114 hours after they can still participate and help defend the colony. Chris - So it’s all in the name of better persuasion against nest raiding. Chris - You may not know this but do furry animal fare better? As in do bees manage to find it harder to sting things like dogs and bears and things that might go after their nest because they go to the exposed parts on us? My brother, who keeps bees, told me that when his bees get into your hair, because we watched a swarm arrive at a capture hive he’d set up the other day and we had them all buzzing round us, he said just watch out if they get in your hair because the tend to panic when they get in your hair and then they just sting you. None did sting us but do furry things fare better - or fur better? Eleanor - I don’t know. I would guess it would probably depend on the type of fur. Because I guess if you could get like our hair, if you get tangled in it you’d have someone panicking. But I would wonder whether on other animals, the fur is kind of thick enough that you can’t sting through, like us wearing our beekeeping suits. Previous Does light weigh anything? Next Can I train my goldfish? Is it possible to perform coronary bypass via catheter? Naked at Edinburgh Science Festival!